Synthesis of αGalCerMPEG. The parental compound αGalCer (A) was mixed with methyl-PEG-COOH (R-PEG-COOH) in the presence of hydroxybenzotriazole (HOBt) and 1 di-isopropylcarbodiimide (DIC). This led to an intermediate compound (B), which was purified and hydrogenated using palladium/active charcoals (Pd/A) as catalyst. The resulting αGalCerMPEG (C) was purified by silica gel chromatography, and its purity was analyzed by reverse-phase HPLC using a LUNA column and evaporative light scattering detection. The peak corresponding to the final product is indicated by an arrow (D). Activation and maturation of murine DC by αGalCerMPEG. The expression of surface markers was investigated by flow cytometry on CD11c+-gated bone marrow-derived murine DC before (shaded area) and after stimulation with either 1.7 pM αGalCerMPEG (continuous line) or 58 pM αGalCer (broken line). One representative experiment of three is shown. 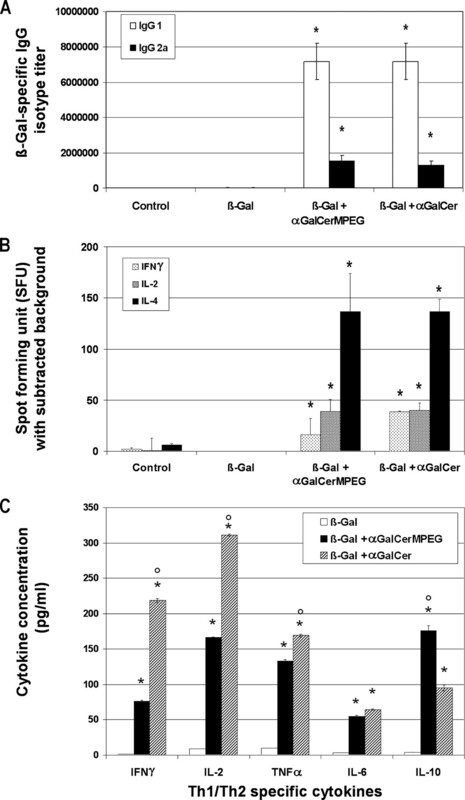 Comparative analysis of the stimulatory activities of αGalCerMPEG and αGalCer. 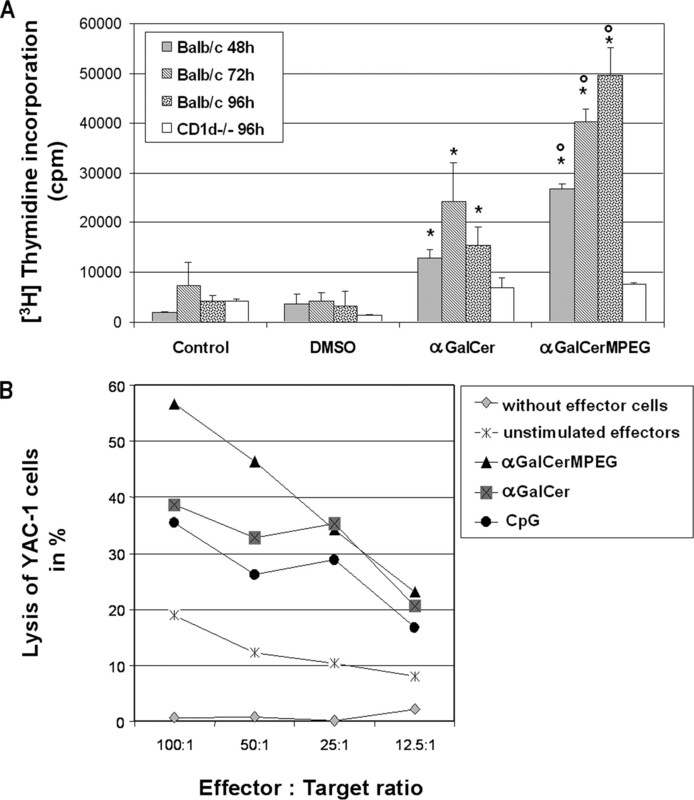 A, Spleen cells from CD1d−/− and BALB/c mice were stimulated in vitro with αGalCer (11.7 nM active moiety) and αGalCerMPEG (0.35 nM active moiety) for 48, 72, and 96 h. Cellular proliferation was assessed by determination of the [3H]thymidine incorporated into the DNA of replicating cells. Results are averages of triplicates and they are expressed as cpm. SEM is indicated by the vertical lines. One representative of four independent experiments is shown. B, In vivo stimulation of lytic activity by αGalCerMPEG. Spleen cells from mice injected with αGalCer (11.7 nM), αGalCerMPEG (0.35 nM), or CpG (2.25 nM) were recovered after 48 h and used as effectors in a 51Cr-release assay with YAC-1 cell targets. The results are expressed as percentage of lysis and they are average of triplicates. One representative of three independent experiments is shown. ∗, The values were significantly (p < 0.05) different with respect to those from control cells (untreated and DMSO treated). ○, Significantly (p < 0.05) different values with respect to results obtained with αGalCer-treated cells. Humoral immune responses stimulated in mice vaccinated using αGalCerMPEG as adjuvant. A, Kinetic analysis of anti-β-Gal IgG responses in sera from mice (n = 5) immunized on days 1, 14, and 28 (indicated by arrows) with PBS (controls), β-Gal (30 μg/dose), β-Gal + αGalCer (11.7 nM/dose), or β-Gal + αGalCerMPEG (0.35 nM/dose) by the i.n. route. Results are expressed as the mean end point titers; SEM is indicated by vertical lines. One representative of three independent experiments is shown. B, Stimulation of sIgA responses in mice immunized using αGalCerMPEG as adjuvant. The presence of β-Gal-specific sIgA was investigated in NL, BAL, and VL by ELISA. Results are expressed as mean β-Gal-specific sIgA titers with respect to 1 μg of total sIgA. SEM is indicated by vertical lines. One representative of three independent experiments is shown. ∗, The obtained results were significantly different (p < 0.05) with respect to those from animals immunized with PBS or β-Gal alone. ○, Significantly (p < 0.05) different values with respect to results obtained in mice immunized with β-Gal + αGalCer. Analysis of the Th responses stimulated in mice vaccinated using αGalCerMPEG as adjuvant. A, Determination of the β-Gal-specific IgG isotypes present in sera. Results are expressed as mean end point titers. One representative of four independent experiments is shown. B, Detection of IFN-γ-, IL-2-, and IL-4-secreting cells in immunized mice. Spleen cells (1 × 106 and 5 × 105 cells/well) recovered from vaccinated animals were incubated in the presence of either the β-Gal protein (for IL-2 and IL-4) or a peptide (TPH PARIGL) encompassing its immunodominant MHC class I-restricted epitope (for IFN-γ). Then, the numbers of IFN-γ-, IL-2-, and IL-4-producing cells was determined by ELISPOT. Results are presented as spot forming units per 106 cells, which were subtracted from the values obtained from nonstimulated cells. One representative of three independent experiments is shown. The SEM of triplicates is indicated by vertical lines. C, Determination of the cytokines secreted by spleen cells recovered from vaccinated animals after in vitro restimulation with the β-Gal Ag. 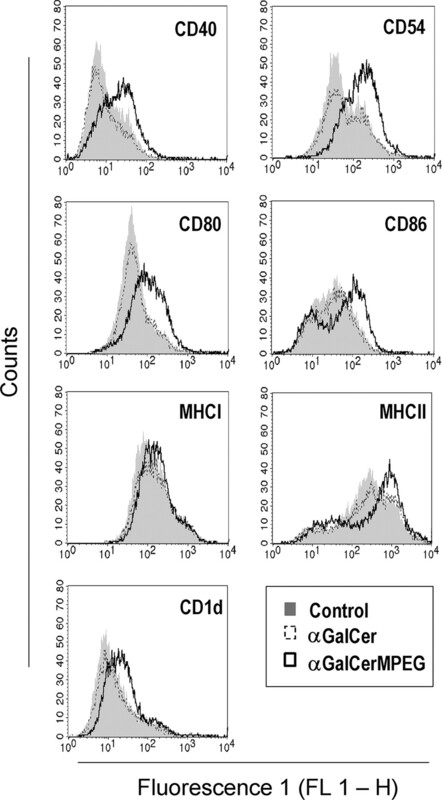 The amount of cytokines present in supernatant fluids of stimulated cells was measured by FACS using a cytometric bead array (BD Pharmingen). One representative of three independent experiments is shown. ∗, The obtained results were significantly different (p < 0.05) with respect to those from animals immunized with PBS and/or β-Gal alone. ○, Significantly (p < 0.05) different values with respect to results obtained in mice immunized with β-Gal + α-GalCer. a Signals at 69.2, 69.4, 70.3, and 72.4 ppm (4 × d). a One representative experiment of three independent tests is shown.